A family member recently visited Chilis in Edmonton for dinner. That got me thinking that there may be some good gluten free menu options at Chilis, because I would not be surprised if corn tortillas are used for their menu items. I visited http://www.chilis.com/ and got some good answers, including a frequently updated allergy menu. They also have a great gluten free tip with notices to always check back and contact Chilis about there allergy chart, because their suppliers sometimes change recipes, or they sometimes change suppliers for an ingredient. Click here to view their allergy alerts. Let us know how your Chilis experience was and what items you have tried out! This is the second Gluten Free Recipe courtesy of http://www.riceinfo.com/. 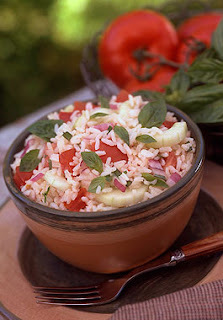 Click here for more gluten free recipes from the Riceinfo.com. This pudding parfait will make your weekend! 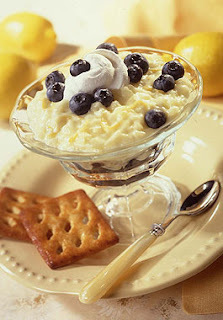 Blueberries and lemon team up in this light, creamy rice pudding that’s a perfect ending to a great meal. In a medium saucepan, combine sugar, eggs, egg yolks, lemon juice, and lemon rind. Cook over medium-low heat until thick and creamy (8 to 10 minutes), stirring constantly. Remove from heat; stir in butter and rice. Cool. Fold in 1 cup (250 mL) of the whipped cream. Alternate layers of blueberries and rice pudding in parfait glasses. Garnish with remaining whipped cream and blueberries. Have you tried this recipe? Let us know it works out for you? If you are a newly diagnosed Celiac living in Edmonton, your first stop should be the Canadian Celiac Association, Edmonton Chapter. The Edmonton chapter of the Canadian Celiac Association offers you the assistance you need to cope with a recent diagnoses of Celiac. The Edmonton chapter also serves northern Alberta (Red Deer & north) as well as the Yukon, parts of NWT and north eastern BC. There are monthly Anti Panic Session's that help prepare you for your new gluten free journey. It is a great introductory to the gluten free diet with help on how to read labels and where to shop. There is also a Edmonton Chapter Calendar of Events that includes information on all Anti Panic Session's, Business meetings, and special social meetings like Celiac dinners, Celiac Awareness Month and annual Pancake Breakfast at Kinnikinnick! Visit the Edmonton Chapter Projects page for more information on the association programs, developements, resources and more! How has the Canadian Celiac Association, Edmonton Chapter helped you? Let us know your stories! Swiss Chalet, always so good for so little... and gluten free! Swiss Chalet is a fantastic gluten free option in Edmonton for that good ole comfort food that you can trust. By no means does Swiss Chalet have a strict gluten free kitchen, or a separate gluten free menu, but they take their allergy control seriously. The best thing is, that their chalet dipping sauce is gluten free! Unfortunately, as usual the darn deep fryer for french fries could be shared with other foods. So depending on your sensitivity, it may be okay. You may also find some locations have dedicated fryers. Pleas always remember the Celiac's sometimes do not have a reaction to cross contamination, however damage to the small intestine could still occur. Note August 2010: The Swiss Chalet allergy guide now indicates that the fries are not gluten free with an asterisk because they are deep fried with other breaded materials so cross contamination may occur. We have visited two Edmonton locations, one downtown at Jasper and 109 St. and the west end location by the Mayfield Hotel. Each time, we just do take out, and we let the cashier know that 'no buns, because of an allergy'. That one line sets off a chain reaction. The order taker turns around to tell the kitchen staff about the allergy, and then the kitchen staff preparing your meal then proceeds to take away the cutting board and utencils for a good clean. The french fries have not bothered Amanda thus far, but everyone has different tolerances. We recommend if you are concerned, that you just order a salad. 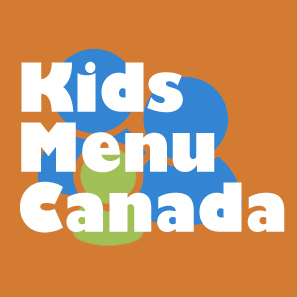 Check out the Swiss Chalet allergy guide for more information. Let us know about your Swiss Chalet experience in Edmonton! So it was birthday season for our family, four in total! 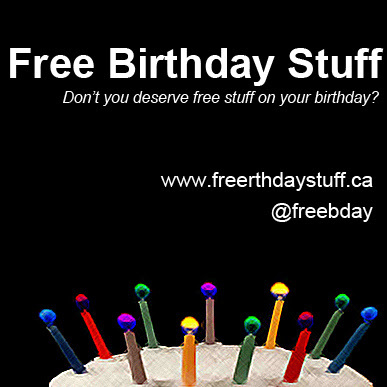 We were looking for an alternative birthday cake, and turned to cupcakes! These Kinnikinnick cupcakes are awesome an awesome gluten free product and of course have whicked icing ontop. They are also priced cheaper than the gourmet cupcakes purchased at the Cupcake Shop. The Kinnikinnick gluten free cupcakes can be found at the Kinnikinnick store in Edmonton and at 2 for $2.25, they made this the perfect birthday month. Let us know how you used the cupcakes to satisfy your dessert cravings! Sukhothai Restaurant in Edmonton has gluten free menu options for it's Celiac customers. Although there is not a separate gluten free menu, their menu does state to let the server know if you have Celiac or an allergy to gluten. They are able to accomodate most of their menu to be gluten free. Sukhothai is a Thai restaurant with a pretty big menu including appetizers, soups, stir fry's, curries, noodles and vegetarian options. The smell outside the doors is fantastic, and their food tasted great. We ordered to share the ginger chicken and phuket noodles with a side of coconut rice. The meals were nicely spiced and full of flavour. The coconut rice was the perfect chaser for your tingling mouth of the chili in the phuket noodles. The dishes are well proportioned and we left the restaurant full (not over stuffed), and cleaned off our plates. Other customers seemed to be enjoying the atmosphere and food while ordering bottles of wine to go with their meals. Menu prices for entrees range from $16 to $24. This gluten free meal for two rounded to just over $50 including tax and tip. Let us know what you thought about Sukhothai and what your favourite menu items are, and we will update this review. I would definately recommend this gluten free product to anyone that likes to snack on cookies. The Pamela's gluten free brand can be found in Edmonton at Planet Organic near Whyte Ave, or Downtown on Jasper. Let us know how you rate these gluten free cookies!